The program is committed to training a diverse group of prosthetists-orthotists who come from a wide range of ethnic, cultural, educational, and socioeconomic backgrounds. Admission to the MPO program is based not only on academic achievement, but also on non-academic factors, which ensure that candidates can complete the essential functions of the academic program required for graduation. The Division of Prosthetics-Orthotics has the responsibility to ensure that its graduates become fully competent and caring practitioners. Enrollment in the program is limited to 12 students each year, and the application process is competitive. Bachelor's Degree Applicants must have a baccalaureate degree in any major from a regionally accredited college or university in the U.S. or its equivalent from a foreign institution. Grade Point Requirements Applicants must have a cumulative grade point average of at least 3.0 (B) on the most recent 60 semester or 90 quarter credits to be considered for admission. In addition, applicants must have a cumulative grade point average of at least 3.0 (B) in the required prerequisite courses with no single course graded less than 2.0 (C). It is highly recommended that all prerequisite course grades be 2.5 or above. If you have any prerequisite course grade between 2.0 and 2.4, your academic record will be reviewed on a case-by-case basis. Grades lower than 2.0 in a prerequisite course will not be accepted. Graduate Record Examination (GRE) Applicants are required to submit GRE general test scores taken within the past five years. Please visit the ETS site for more information on registering and taking the test. The UW institution code is 4854. Prerequisite Requirements The most competitive applicants have completed a majority of the prerequisite courses either by the time of application or by the end of the term in which the application is submitted. It is highly recommended that anatomy and physiology be among the completed coursework. All prerequisite courses must be completed prior to entering the program in Autumn Quarter. Applicants will be asked to submit a reasonable plan for completing any remaining unsatisfied prerequisite courses prior to program entrance. For more detail information about prerequisite requirements visit the Prerequisite Page. Volunteer Experience (highly recommended) Although volunteer experience is not required to apply to the program, the most competitive applicants have a minimum of 50 hours volunteering, observing, or job shadowing in a P&O clinic. 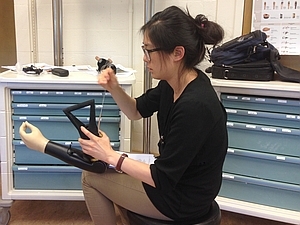 Gaining direct understanding of the daily experiences of a prosthetist-orthotist is the best way to help a potential applicant make the decision to pursue an education and career in prosthetics-orthotics. Exposure in more than one setting is ideal. To locate clinicians in a specific area, use the directory tool on The American Board for Certification in Orthotics, Prosthetics and Pedorthics web site. The University of Washington MPO program requires two applications for submission: one application through the O&P Centralized Application System (OPCAS) and one through the UW Graduate School. The deadline for OPCAS and UW Grad School application submission is November 15. Applicants must submit an online application to the University of Washington Graduate School. OPCAS captures the bulk of information needed for consideration, but applicants need to fill out basic information in the Grad School online application and submit GRE test scores to the UW, using institution code 4854. Please note that on the UW Grad School application, underrepresented minorities may choose to submit an additional, optional personal statement that addresses personal history, family background, and other influences on intellectual development. The statement should address educational, cultural, and economic opportunities and disadvantages experienced by the applicant, as well as how these experiences have affected the development of special interests, career plans, and future goals. DEADLINE: The deadline for OPCAS and UW Grad School application submission is November 15. Applications are open to residents of any state. Contact the Residence Classification Office at (206) 543-4188 or visit the residency website for information about establishing residency in Washington State. Detailed information about International student applications to the Graduate School of the University Washington is on the Grad School website. 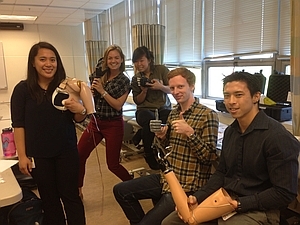 The Prosthetics & Orthotics Admissions Committee will evaluate each applicant for admission through a review of scholastic achievement, written essay, references, and involvement in activities or work related to health professions. Applicants are strongly encouraged to work or volunteer in the profession to demonstrate their interest in, and understanding of the field. Committee members conduct independent assessments of each candidate. Candidates for admission are then recommended to the Prosthetics & Orthotics Advisory and Evaluation Committee, who make the final decision on admissions. Written notification of admission or non-admission is emailed to each applicant by mid-March to mid-April. Students who accept a position in the MPO program will be asked to complete a comprehensive background check administered by Verified Credentials. The cost for the background check is currently $69.00. The State of Washington requires this background check to identify individuals who have been convicted of felonies against vulnerable populations. The hospitals and clinics that are used for training are not allowed to employ or train people with these backgrounds. MPO program students pay Tier II graduate tuition and fees. (Resident and Nonresident rates for Academic Year 2016-2017 only. These rates do not include summer quarter tuition.) The complete program is seven consecutive quarters, including a summer quarter. Other expenses include tools, books, supplies, room and board, travel expenses associated with clinical education, and lab fees, which are currently approximately $2,200 per year paid on a quarterly basis. Lab fees vary according to the number of hours spent in Prosthetics & Orthotics classes and the materials used. Lab fees are subject to annual increases. A fee of $185 is assessed annually for the Health Sciences Immunization Program. 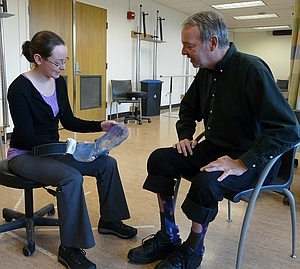 The Prosthetics & Orthotics Program involves a full-time course load each quarter. For this reason, most students find it difficult to work while in the program. Information on financial assistance and scholarships may be obtained from the University of Washington Office of Financial Aid. Students should apply for financial aid as soon as possible, and prior to potential admission to the program. Most students arrange for student loans if they need financial assistance. Office of Fellowships and Awards: The UW Graduate School provides numerous resources for finding information on graduate school funding. We advise you to contact the Office of Fellowships and Awards for more information. Graduate Opportunities and Minority Achievement Program (GO-MAP): GO-MAP, a unit of The Graduate School, has limited funding for students whose individual experiences and/or academic interests will bring diversity to scholarly perspectives and endeavors, and to the academic community. Students must be nominated by their department. For information, please review the GO-MAP funding information page. The deadline to apply to the Master of Prothetics & Orthotics program is November 15th of each calendar year.